We started our trip with a morning pick up in Milford, CT and were soon winging our way towards our first destination of the day Sterling Forest State Park. 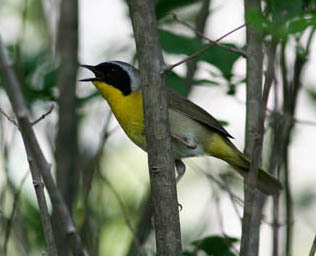 Upon arrival we were soon experiencing our first singing warblers of the trip. As we explored the power line cut and woodland edges Prairie Warblers sang from the scrub, and a host of other species joined in the chorus including a stunning and confiding Chestnut-sided, which put on quite a show for the group as well as the more ubiquitous Yellows, Common Yellowthroats and Blue-winged Warblers. Our main quarry at this site was the much rarer cousin of the Blue-winged and after much toing-and-froing chasing a couple of somewhat more elusive individuals we finally nailed down a beautiful singing male Golden-winged and got scoped views of this stunning bird as it sang anchored to a perch. 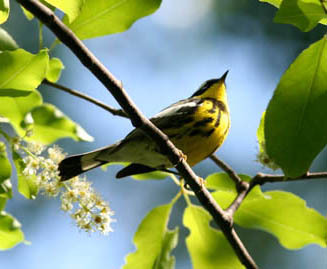 Around us Hooded Warbler song rang out and Lorraine and Bob managed to briefly spot one of these spectacular warblers whilst the rest of the group was looking the wrong direction. Spring really is a time to focus on warblers for most people but these weren’t the only goodies to grace us with their presence. A Broad-winged Hawk put in a nice flyover appearance and we also picked out Scarlet Tanager, Indigo Buntings and a few Baltimore Orioles – a pretty dazzling trio of bird species! Perhaps the most exciting sightings though were a pair of American Woodcock that flushed from the thickets around us. We carefully backed away from them and hoped that they might return to what we believed to be a nesting site. Continuing on to another little spot in the park we were soon onto our first Cerulean Warblers of the trip and we were graced with great views of these treetop specialists. It seemed to be a particularly fine year for them and we soon had decent sightings of about a half-dozen more individuals. After a lunch break we were on the way for a late afternoon stop at Iona Island. Amongst some of the more regular sightings (Yellow Warbler, American Redstart, Warbling Vireo etc) we picked up our first Orchard Orioles of the tour. The Orioles were making an absolute racket and put on quite the show for us which provided great views for all. We also picked up our first of a smattering of shorebirds for the trip, in the shape of a handful of Least Sandpipers. After an excellent meal in the picturesque downtown section of Beacon we headed back to our hotel just as the sun was beginning to go down. However our birding wasn’t completely finished as we picked up a couple of high-flying Common Nighthawks over the parking lot and a rather spectacular breeding plumaged Common Loon that was sitting on the lake right outside the hotel. Our second day started bright and early with a post breakfast run to the locally renowned Doodletown Road. The migrant hotspot was soon living up to its reputation as Jan spied a welcome Olive-sided Flycatcher perched high up on a bare snag (no surprise there then). Although the place wasn’t thick with migrants there were lots of other breeding goodies to be enjoyed - including more Hooded Warblers than you could shake a stick at and an equal number of dazzling Ceruleans. Amongst such regular breeders including American Redstart, Least Flycatcher and Indigo Buntings we also managed to eek out a few nice migrants including brief views of a stunning male Bay-breasted Warbler and after much work a stunning Canada. Shorebirds are always tough to come by on this trip, so a pair of not so Solitary Sandpipers was another nice addition, as they worked the muddy fringes of the old town reservoir. Doodletown is a fascinating site in and of itself - a ghost town created by the removal of the village that resided here prior to its purchase as part of Bear Mountain State Park lands. The remains of some of the foundations, roads and other infrastructure is eerily reminiscent of those books and TV shows that try to imagine what the world would be like if people were suddenly to disappear from the planet – quite an interesting setting for a mornings birding. After a nice break at a diner for brunch we were on to one of my favorite sites of the tour. Personally I love little unknown sites that are wedged in-between the hustle and bustle of suburbia and the next site falls distinctly into that category. On first view the site is somewhat underwhelming (‘why are we stopping here’ is a typical response!) but as we stepped off the main road the sites charms quickly announced themselves as an impressive adult Bald Eagle soared up from the surrounding marsh. As we forayed further into the marsh more expected species revealed themselves: Willow Flycatchers sang (if that’s what you can call their sneezy calls), Marsh Wrens gave out their gurgling calls and Common Moorhens chuckled away. We hoped for a couple of rails here, however although a Sora called it never appeared close enough for actual viewing. 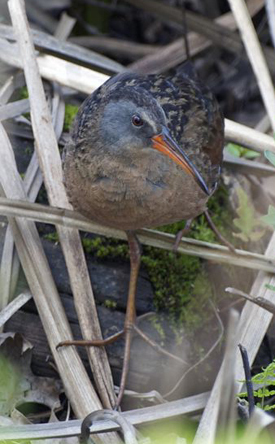 The Virginia Rail however was much more accommodating as it grunted away at us and finally appeared almost right down at our very feet! With a Bank Swallow or two adding to the growing list we were on our way with a healthy collection of interesting birds added to the mix! The next stop was a bucolic airfield just a stones throw away. With heightened security prevalent at most airports it feels a little strange to be able to just drive in and poke around looking for birds, and although we had no joy with the hoped for Uppies we added a few of the more common grassland birds (a somewhat relative term these days it seems in the northeast). With good views of Bobolinks, Eastern Meadowlarks and Savannah Sparrows all under our belts we certainly left satisfied with our little haul. With the heat of the day building we decided to make a run to the night’s hotel and dropped our bags before heading out for an early dinner. Post dinner we were off again for some evening birding at the renowned Bashakill. 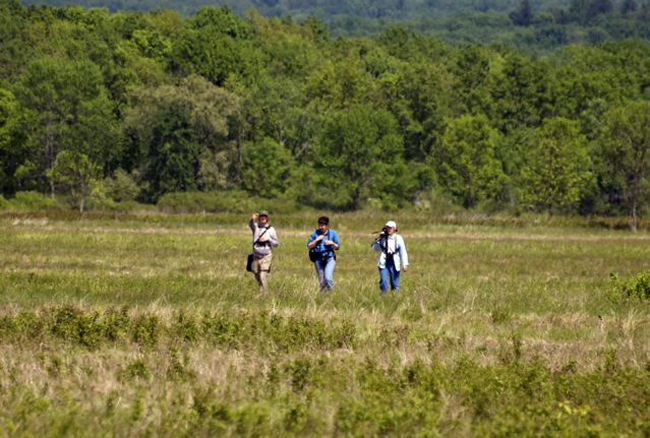 This highly scenic spot near Wurtsboro New York hosts an array of fantastic birds and an evening foray to this shallow marsh always provides for some intriguing birding. The evening highlight here is the expected American Bittern show, and we were not to be disappointed. Within a few minutes we could hear the loud gulps of at least one bird as it began to pump out its haunting booming call and before long we had excellent scoped views off the bird. As we watched the performance Toby spotted a second bird and something of a Mexican standoff developed between these two birds: simply incredible. Bitterns are always a treat to see at any time of the year but a full on performance by not one but two birds is a real treat. As well as the Bitterns there was much else to enjoy as we picked up a few more Common Nighthawks overhead, a myriad of different swallows and enjoyed watching the numerous Wood Ducks as they skittered through the marshes or flew to their boxes and roosts for the night. From the surrounding woods the lilting song of Veerys rang out clearly amongst the calls and chips of numerous other species. With the light of the day slowly disappearing we got word that a Mourning Warbler had been seen loitering all day at a nearby turnoff and we decided to give it a little bash there; more in hope than expectation. Although we could hear the bird chipping and calling intermittently looks were somewhat harder to come by and a couple of fleeting and partial views in the dying light were the best we could manage. We immediately vowed to return early the next morning and see whether the bird might have hung around for the night. As we headed back to the van one of the singing Veerys hopped out on a nearby rock and gave us incredible close views. We then went for a short and unproductive drive through some local woods listening for some of the nocturnal species that call the area home before deciding to call it a night in order to get a good nights sleep ready for another big day of birding action. We awoke early and set off for the Mourning Warbler site from the following evening and low and behold the bird was still exactly where it had been the day before. With no other birders having arrived at this popular migrant trap we had a while with the bird all to ourselves as we finally eked out fantastic views of this skulky warbler. As we hiked the path into the site we soon realized there was a second Mourning singing a different song and we managed to get brief views of another of these uncommon and much sought after birds. 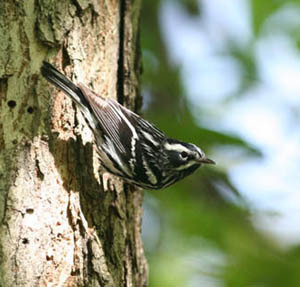 Although there was nothing exceptionally rare to be found as we hiked the trails there was a nice mix of migrant warblers including a multitude of Chestnut-sideds, Magnolias and Canadas: an incredible splash of vibrant avian colors streaming through the woods. As well as the bejeweled warblers there were other goodies here but less vibrantly colored ones, a good number of Veerys worked the woodland path, Northern Waterthrushes sang, an Eastern Pewee repeatedly sang out it’s own name and empids of the Least and Willow variety chirped. We watched a calling Least for a while in amusement, its whole body shaking as it threw its mouth open unfeasibly wide in order to bark out its short little song. From the marshy edges we heard the calls of Yellow-billed Cuckoos and somewhere in the marshes Virginia Rails grunted. We again heard the distinctive calling of the Bittern and once again garnered good views of this cryptically colored marsh denizen. With a nice mix of birds under our belts we left the gathering birding clans to the marsh and struck out for another site to try our luck there. This was more of an open site and with it we hoped to find some more open country specialists. Our first good sighting was an ever-growing flock of White-crowned Sparrows. Often hard to find in spring, we stumbled upon a flock of seven of these distinctive zonotrichia sparrows as they worked the hedgerows. We were soon adding a nice mix of breeding and migrant species that favor these old farm field type areas including Brown Thrasher, Field Sparrow and Eastern Bluebird amongst others. We also stumbled upon a diminutive and delicately marked Lincoln’s Sparrow and our one and only hybrid bird of the trip: Brewster’s Warbler. Looking mostly like a Golden-winged Warbler, there were just a few telltale traits that pointed to some Blue-winged genes in the bird’s genetic makeup. Another possible Tennessee Warbler escaped without definitive views before we headed back to the van. With temperatures rising we decided to get to move on and have a little exploration of some of the nearby pine woodlands to see what they might hold. Wurtsboro is a great little area as all within a few miles of each other one can find a highly varied mix of habitats. Just a short drive from the canal-side fields we had been exploring we were into pine woodland with a dense and healthy understory (so different than most of those in Southern Connecticut). Here we stumbled upon a couple of local birders who were embarking on their own big day (a local event to try and break 100 species in 24hrs) and we joined up with them as we searched for warbler action. They were taking a more active approach to birding and quickly got out an iPod complete with taped Barred Owl call. The owl call immediately had the desired effect with a little group of inquisitive Black-capped Chickadees coming to see what all the fuss was about. The dee-dee-dees of the Chickadee soon had a few other little passerines flying in to check out the ‘predator’ in their midst and we were soon enjoying cracking views of multiple Blackburnian and Black-throated Green Warblers. Even with the tape now off the Blackburnians stuck around for a while giving us repeated great looks at these fiery throated warblers; perhaps one of North Americas most stunning birds? Before we had to depart the area, we had time for another little stop to add empid species number three to the weekends tally, in the shape of a very vocal Acadian. The Acadian gave us quite the run-around for a little while but eventually we all got pleasing looks at the bird. These close views of three different empidonax species allowed us to have some interesting discussions on visual identification of these cryptic flycatchers. Of course vocal identification is the safest way to go with these birds but habitat and some careful study of visual clues at least give you an idea of what the bird is most likely to be. As we worked on the Acadian we managed to add another warbler species to the growing list as a Louisiana Waterthrush sounded off behind us. With a little drive through some winding roads and scenic countryside behind us we were on to our last stops of the trip: a few little sites in the areas around Wallkill. First up we made a short foray around Blue Chip Farm - although the nomadic Red-headed Woodpeckers were nowhere to be seen this year we did manage to pick up rather nice views of a small group of Upland Sandpipers. This species is becoming increasingly hard to find locally so it’s always a treat to get good looks at these distinctive ‘grasspipers’. Onto the preserve grasslands itself we were soon greeted with some nice grassland birds including a female Northern Harrier that lifted up from the fields and one of the locally nesting American Kestrels. Added to that were a good number of Eastern Meadowlarks and Bobolinks. The sheer size of the grasslands always impresses and the edge habitat also produced a nice assortment of birds. With our trip almost at an end we got a tip off from a friend who just happened to have stopped by to see the Upland Sandpipers that there was a Snow Goose still loitering on one of the local horse paddock ponds. Almost unbelievably just a 5 minute drive down the road and we were watching what appeared to be a healthy Snow Goose feeding around the edge of a small pond in amongst a group of the regular Canada Geese. A pretty welcome addition to the trip list and probably the most unexpected one! The pond edges also held a few surprises including a good number of Least Sandpipers, a handful of Spotted Sandpipers and a rather nice Solitary! As we boarded the van for the last time and made our way back to Connecticut Jan added up our sightings for the day and realized that we could have entered the local ‘Break 100’ Big Day event ourselves. One hundred species in the day, not a bad tally and a few real goodies in that mix. We just wondered how many species we might have managed had we had the whole day to search instead of going home mid-afternoon. 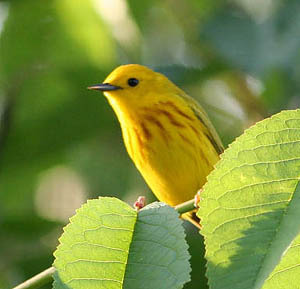 All in all a great weekends birding just across the border in NY State. Thanks to everyone for making it an exciting weekend. Special thanks to Bob Gunderson for the use of his photos.